The Prayer Shawl Ministry creates knitted or crocheted prayer shawls for those who are dealing with difficult issues in their lives such as mental health issues, addictions, health crises & loss. 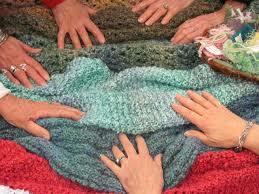 Over the past 7 years, 227 shawls have been blessed and gifted! This fall just one group will meet every two weeks.